1Preheat oven to 375°F. Butter an 8-inch round baking pan, line the bottom with a circle of waxed or parchment paper and butter the paper, too. 2In a small saucepan melt the chocolate with the butter over medium-low heat, stirring until smooth. Remove from the heat and whisk in the sugar; pour into a medium bowl and set aside for a few minutes. Whisk in the eggs, then sift the cocoa overtop (sifting just to get rid of any lumps - shake it through a small sieve if you have one, or don't bother - you can see by the photo above that I didn't) and stir until well blended. 3Pour the batter into the prepared pan and bake for 25 minutes, or until the top has formed a thin crust. Cool cake in pan on a rack for 5-10 minutes, then invert onto a serving plate, peel off the waxed paper and then flip back over. 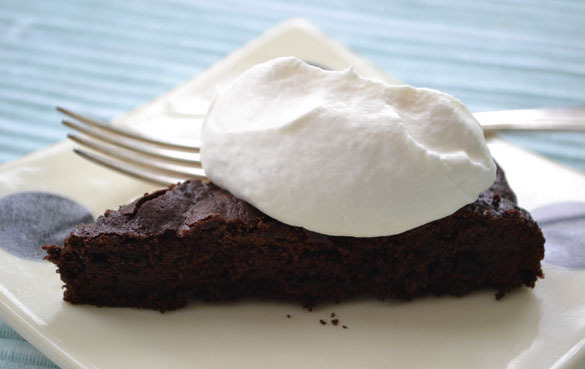 Serve in thin wedges, with whipped cream.